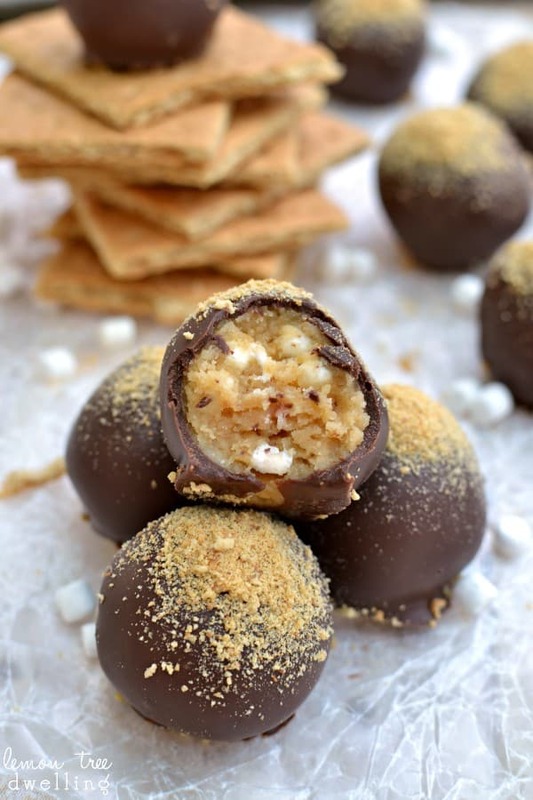 Oreo Truffles meet S’mores in a match made in Heaven! I’m sure I speak for everyone when I say that summer is FLYING by! Summer school is over, my friend Tanya’s wedding is over, and (ohmygosh) July is almost over, too! And we all know that once August hits, the rest of summer basically becomes a countdown to the first day of school! 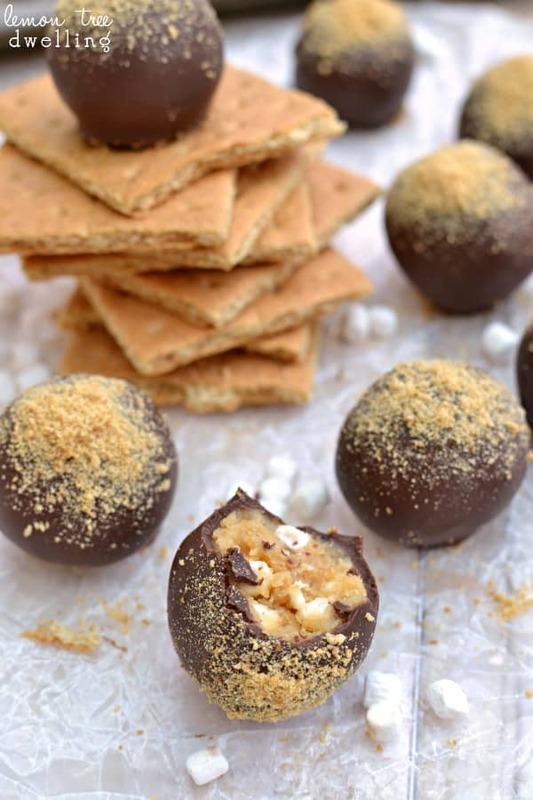 Good thing it’s S’mores Week in Blogland so we all have something to look forward to…! And you know what else we have to look forward to? Our annual family vacation coming up this weekend! Okay, to be honest, calling it a vacation is a little bit of a stretch. (And not just because nothing feels like much of a vacation with 4 kids!) It’s more of a getaway, to a house we rent that’s about 2 1/2 hours away. It’s a tradition we started with my parents and siblings 4 years ago, and it’s a trip we all look forward to each year! ESPECIALLY the kids. There’s swimming and lawn games and board games and relaxing….there’s lots of eating and drinking and laying around and just being together. Of course, there’s also a healthy dose of chaos and a tad bit of stress involved….but for the most part, it’s a chance to unwind and unplug and spend some quality time with one another. Using a food processor, crush Oreos into crumbs. Combine cookie crumbs, cream cheese, and marshmallow bits in a medium bowl. Roll into 1-inch balls and place on cookie sheet lined with wax paper. Remove from refrigerator and dip balls into melted Candiquik. Sprinkle immediately with graham cracker crumbs. So are you ready to check out the rest of the S’mores Week posts? I thought so!! S’Moreo?? I mean … that’s the best name ever!!! Those golden Oreos are my favorite! And with cream cheese?!? Yes!! Summer is flying by! I always feel like after July 4th it’s time for school supplies and new clothes (for the kids … not me!) and then it’s back-to-school time. Ahhhh … why does it always go so fast?? These truffles certainly will make our last few BBQs of the summer much more special! Thanks for an awesome recipe! 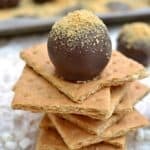 These are so beautiful and the perfect little bite of s’mores for the summer with no firepit! Cathy, these look perfect! We don’t do fires with the young kids so again, PERFECT! Can’t wait to see the rest you have planned for #smoreweek! 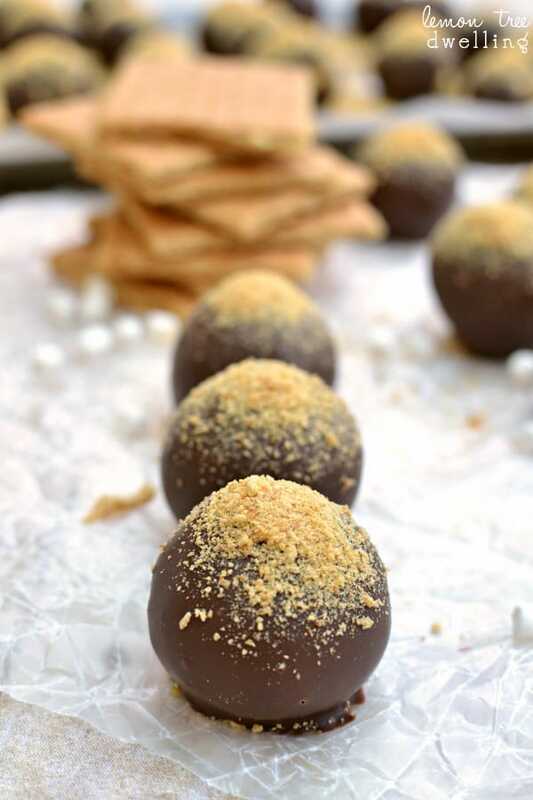 oh my gosh…I love plain golden oreo truffles so I know I would have no problem finding a place for these!! Such a great truffle recipe. Been too long since I’ve made truffles of any kind. Love the crumbs sprinkled on top. These look simply amazing. I love bite-size treats!! Cathy! This sounds incredible! I so just want to sit at home tonight, watch my shows, and pop these in my mouth all night! YUM! There is no way my husband will leave any for me! These are a dream come true! The mini marshmallows are completely adorable and perfect in these truffles! Good solution for fire-less s’mores flavors! Aren’t these just little drops of heaven! Yum! 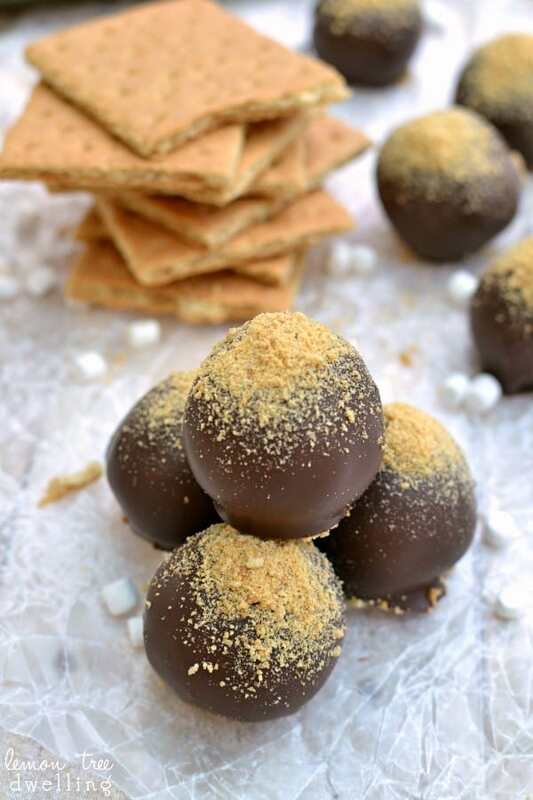 Seriously, who needs a firepit with these yummy truffles! Love these, Cathy! i am SO craving one of these right now.. they look seriously too good. 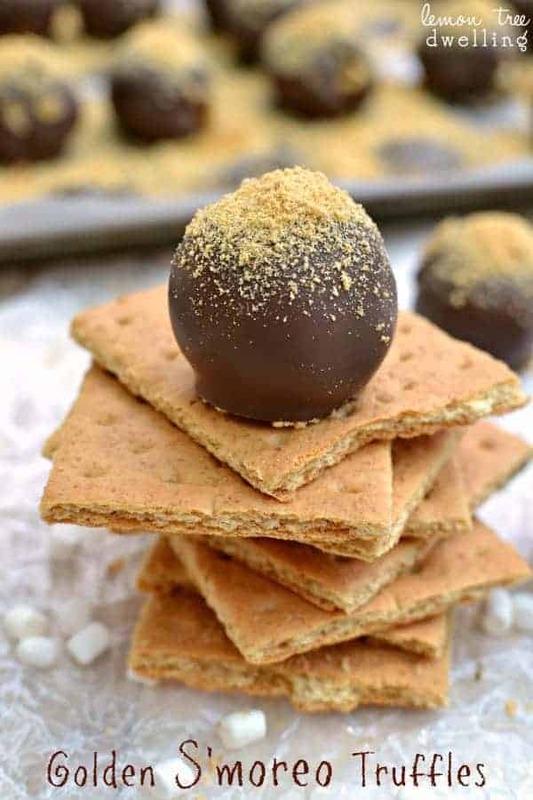 love smores… definitely need to make this recipe! OK…this is new to me. Could someone please tell me where to find Candiquick? Thanks! Love the idea to use the marshmallow bits! These look incredible. Help. I live in Canada. Where do you find Candiquick and marshmallow bits?